Thank you all for being here. Experience this workshop for yourselves. If you find it has value for you, it will find its way into your classrooms. I am an English teacher, with 30 years of undergraduate classroom experience. I gave up full time teaching because I wanted to address more fundamental issues in school education in India. I love the theatre, and for many years now I have also been involved with a Bangalore-based NGO that works on issues of urban poverty. Now I am a full time practitioner of Theatre of the Oppressed, a community education tool that helps me integrate all these three passions. 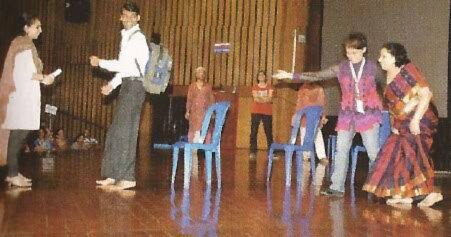 The foundational philosophy of the Theatre of the Oppressed is derived from the educationist Paulo Freire’s book Pedagogy of the Oppressed. My aim in this workshop is to introduce to you two concepts central to this work- ‘dialogue’ and ‘critical thinking’. Dialogue is not just two people talking. In fact, there need not even be any words spoken, for dialogue to happen. Dialogue is about active listening, and about moving towards the ‘other’. Meaningful dialogue can only happen when the two people dialoguing are on the same level. We’ll look at critical thinking in the second part of this workshop. After a short warm-up game, participants played Columbian Hypnosis, a game played in pairs, and in silence. Using their bodies and physical movements, they experience leading and following, first at the physical level; and gradually, aided by the silence and the concentration, the physical sensations lead to a deep communication between the partners, deeper perhaps because it is non verbal. The game has three stages, and instructions were given through the game, that enabled participants to experience and understand that (i) all the games in Theatre of the Oppressed are metaphors for life, and (ii) the deeper your investment and engagement in the game, the more profound your insight. At the end of the game, several participants shared their experience. We will now move on to the second part of this workshop. One of the most popular and widely used structures in Theatre of the Oppressed, Forum Theatre is a problem solving technique. You will watch a short scene, identify the problem, and will actually get an opportunity to explore multiple solutions to the problem. We present to you, The Race! accompanied by an ambitious parent ,(ii) a person carrying a heavy backpack, with 3 chairs placed in his path, and(iii) a person with her legs tied together. At the finish line is a an authority figure holding a scroll( a degree certificate) in one hand, and with a placard on her back saying PhD, MBA etc. “On your mark, get set, GO!” The first runner easily wins the race, grabs the reward, and they’re off , while the other two are still struggling on the track. Several problems were identified in the scene : unfair competition, social inequity, discrimination, an education system that ignores individual learners,, etc. When asked who they thought was the character struggling the most, the audience identified the second and third runners. Instructions were given to the audience for the Forum. What we witnessed is the anti-model- something that we would like to change. up on stage, replace the character who’s struggling, and try out your strategy. know someone who’s been there. Several interesting interventions happened. From ‘shedding the bag’, to ‘hopping’ faster, to asking for help, the interventions showed audiences understood the struggles, and had their own individual solutions to offer. After each intervention, the characters who had to engage with the new situation presented by the interventions were asked for their responses. The audience was also asked whether they thought the strategies would be effective. There were several very insightful comments and questions from the audience. 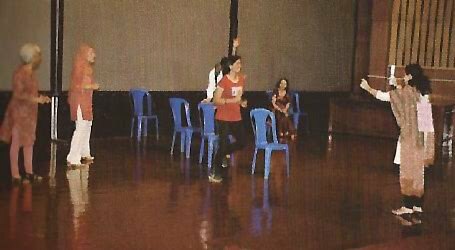 At the end the audience felt that games such as Columbian Hypnosis as well as the Forum had strong application possibilities in school education.